We work hard to earn our money. But regardless of how much we earn, the money worry never goes away. Bills, rent, EMIs, medical costs, vacations, kids education and, somewhere at the back of the head, the niggling thought about being under-prepared for our own retirement. Wouldn t it be wonderful if our money worked for us just as we work hard for it? What if we had a proven system to identify dud investment schemes? What if could just plug seamlessly into a simple, jargon-free plan to get more value out of our money, and have a super good life today? India s favourite financial planner, Monika Halan, offers you a feet-on-the-ground system to build financial security. Not a get-rich-quick guide, this book helps you build a smart system to live your dream life, rather than stay worried about the right investment or perfect insurance. 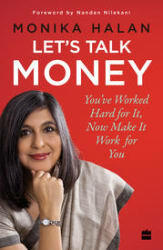 Unlike many personal finance books, Let s Talk Money is written specifically for you, keeping the Indian context in mind. Monika Halan is consulting editor and part of the leadership team at Mint. A certified financial planner, she has served as editor of Outlook Money and worked in some of India s top media organizations, including the Indian Express, the Economic Times and Business Today. She has run four successful TV series around personal finance advice, on NDTV, Zee and Bloomberg India, and is a regular speaker on financial literacy, regulation and consumer issues in retail finance. As part of her public policy service, she is a member of SEBI s Mutual Fund Advisory Committee. She lives in New Delhi and tweets at @monikahalan.